Michigan is such a versatile state and the venues are truly endless - from large airbnb’s, Lake Michigan shore weddings, downtown Detroit industrial warehouses and even mid - state lofts. I wanted to share a few of our favorite venues from 2018, not only in how they photograph but in some of their perks! What to consider when choosing a venue: My best advice is to observe natural lighting. Are there windows? Are there outdoor areas? How photogenic are the grounds? If they are not super photogenic, are you close to any locations that you can travel to for the portrait session? Check reviews! A lot of traditional banquet-type reception venues tend to have uplighting and few windows, which is perfectly fine, but I strongly suggest not having every aspect of your wedding inside of a windowless location- even if just the portrait session is outdoors that's okay. I would check the season you are booking, will they be doing construction? Are other weddings taking place at the same location? What are their backup rain plans? And of course, always tour the venue before booking. Disclaimer: These are just my personal reviews from working at these venues, along with some research I’ve done, but to get complete information for your specific needs I would contact the venues! A rooftop ceremony location that overlooks downtown Kalamazoo. Even if you do not use the rooftop for the ceremony, you could possibly utilize it for some outdoor portraits! Two stories with a ton of character. The main floor is an all white brick room full of natural - light, a lot of windows and a ton of space for guests. The second story is another spacious white brick room, full of natural light which is perfect for a first look and portrait session. It’s spacious enough to handle large bridal parties or families too! The second story is a great option to have your own space for photos, while guests are arriving or enjoying cocktail hour, on another level. The Gatsby Room, a red vintage styled bar area that offers a place for guests to hang out along with another option for portraits. An optional penthouse-suite getting ready room. Want to see a full wedding from here? Click here! Price Range: The price ranges based on all that you decide to book, it’s more of a custom package so I would suggest contacting them directly with your guest count and dates that you are considering. Rainy day alternative: If it rains, you are golden. The space offers so much natural light and indoor locations for photos that you wouldn’t need to worry whatsoever. Even if you planned for a rooftop ceremony, you would be able to still have a gorgeous ceremony in the main floor. Website: https://www.loft310.com or click here. ** Note: They also have sister venues in the same area with just as much character as the Loft. Check out their website for alternatives! EVERYTHING! It has 3 stories with hundreds of windows. LOTS of character to this venue. My best friends’ just planned their wedding here and it was perfect. 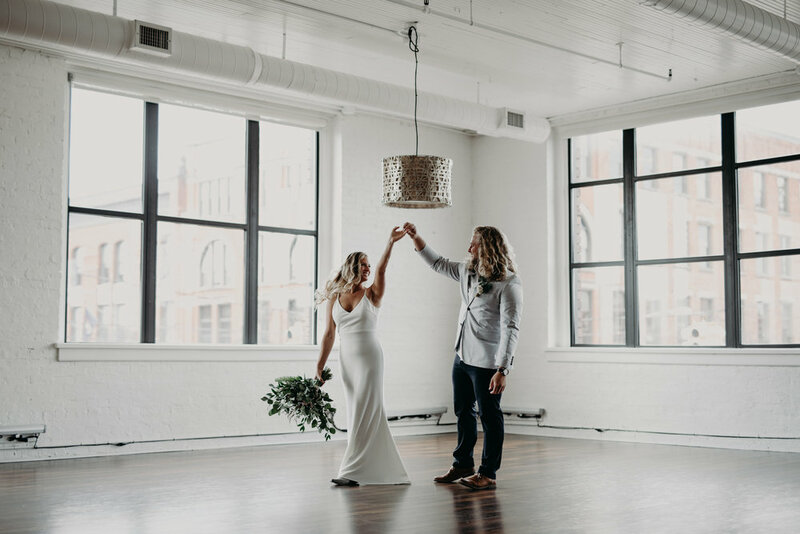 The first floor includes the ceremony + reception location, incredible window light + ceiling lighting along with white brick walls (great for photos). The second floor has tons of knick knacks, victorian couches, colorful walls, vintage decor, tiffany blue piano, repurposed doors, chandeliers. The second floor also includes a getting room for the girls with large mirrors. The third floor is practically empty and surrounded by windows, the large space is absolutely perfect for bridal party photos (large + small). It is tucked away which helps with intimate first looks as well. The venue is downtown so you can do the portrait in Grand Rapids if desired. This is also is a large venue so if you want to have a large guest count- this would be perfect! Price Range: Not listed - inquire for pricing. Rainy day alternative: Everything is indoors and there is so beyond much to work with that you wouldn’t need to worry whatsoever. Website: http://www.thecheneyplace.com or click here! An indoor, spacious, exposed brick area with a lot of room to customize the layout of your day. A garage door that opens to an outdoor patio for guests to hang out (you can add a tent to this area too). Their use of small details really add character and beauty to this space without creating clutter. The beams are painted red and there are string lights that hang from the ceiling to provide additional, yet dynamic, lighting. It is in the heart of Eastern Market which adds an artistic, industrial feel to your day without being in the busy-ness of downtown. Guests can hang out at the murals or shops before, or in between, events. This is also a great spot to take bridal party photos. It’s close enough to downtown Detroit that we can quickly make a few added stops during your portrait session. Price Range: Rates vary between days of the week and hour coverage. According to their rates sheet, it ranges from $150 - $350/hour with a 4 hour minimum. Rainy day alternative: This venue is entirely indoors, aside from the garage opening area, which you could rent a tent for just in case! Website: http://www.theeasterndetroit.com or click here! Indoor ceremony and reception location in the heart of Eastern Market. Fenced outdoor back area with an alleyway to utilize for games or a hang out area. Incredibly large ceilings and space for large guest counts, a large dance floor and areas for guests to hang out along with open doors to let in some natural light. This space is entirely made up of exposed brick. It keeps things very simple so that you can create your own feel with greenery, rentals or any other visions you have. If you are a do-it-yourself bride that wants an industrial look, this venue is perfect. It’s simple with enough architectural beauty to utilize to your advantage. We have had brides use a different ceremony location (like a church) and then host the reception here! Rainy Day Alternative: This venue is totally indoors with an outdoor back area, the back area would be compromised but the indoor location would still stay the same. Website: http://thejamhandy.com or click here! This venue is in Belle Isle park which offers a downtown Detroit feel mixed with nature. You can see the Detroit skyline from the front porch of this venue. Belle Isle has a conservatory and the marble fountain, which you can pass as you drive to the casino. There is a lot of history and character to this venue that really captures the heart of the city. The gorgeous warm outer - tones of this venue photograph really well. The casino has a large wrap-around porch with steps and a bridge in front that guests love to hang out on in the evening during the reception. Guests can step out to talk, while looking at the city, and not be overwhelmed with the reception music. The inside of this casino has thick, white, marble floors that creates an elegant feel to the night. If you are a DIY-couple, or want to be in charge of all of the details, this is a great venue. The architecture of this venue is so beautiful by itself that you don’t need to add too much, but you still can add your own feel to the day. This is a great reception venue but you may want to look into another ceremony location (like a church or maybe another part of Belle Isle) because although it fits a dance floor and dinner tables well, it might be a bit small indoors for a ceremony too. There is a marble staircase that adds dimension to the venue. Price Range: $2,000 for 8 hours, according to their website. Rainy day alternative: The entire venue is indoors with a wrap-around porch that is also covered already. This is great for a rainy day! Website: https://www.belleisleconservancy.org/event-venue-bookings or click here! Two venue options to choose from. Both have an outdoor ceremony location surrounded by greenery, flowers and very spacious grounds. A long walkway in between a row of trees to the ceremony - beautiful for walking down the aisle shots (Both ceremony locations have this). Outdoor bar + dancing area, indoor reception. The Carriage House is a wooden A-frame reception room with tall windows. The wood photographs great, especially if you add some greenery or lavender. The Raisin Room is a bit smaller but perfect for an intimate guest count. It has brick, a stage and a ton of character. It’s a very cozy area that connects to a lush, green ceremony location. Price Range: Depending on the room you get, which day of the week and year you’d like, there is a $1500 - $2000 deposit. Other than that, you have to inquire for a full total. Rainy day alternative: There is a space outdoors with an roof covering that I believe would be manageable for a rainy ceremony, but you would have to talk to the venue! Website: http://www.wellersweddings.com or click here! An outdoor ceremony location in between a row of lush trees. A warehouse full of windows + vintage cars for the portrait session. This warehouse area allows for some creative, yet elegant, photo spots. Guests also really love the history of this venue and have the option to take a tour during the reception. The reception location is spacious, has an industrial feel with windows, ceiling lighting and there are vintage cars parked inside of the reception room (another wow-factor for guests). There is an additional room that can host ceremonies on a rainy day (or not-rainy days). It is all white with blue tones and an entire wall of windows. If it isn’t used for the ceremony, it’s a great spot for a few portraits. Packard is on a very large property. Aside from the three buildings you can utilize, there is enough greenery to get a nature feel in your day too. Price Range: Fill out a contact form on their website for a quote. Rainy day alternative: If it rains, the three buildings are enough to utilize without any stress for guests. Website: http://packardweddings.com or click here! ** These were some of our favorites in 2018, but there were a TON of venues we worked at this year (and years prior) that we also loved! If you need any other recommendations, just send me a message and I would love to send more!